Polished CNC cut acrylic, two-way mirror glass, drafting film, electronics and seamless video loop. A screen stands between two panes of two-way mirror glass which are set at sixty degrees to each other. In the image below, the screen is the front-most rectangular panel. The others are reflections , and reflections of reflections, of it. The projection consists of two infinite hexagonal grids, one of which slides over the other in the vertical axis. At a certain point, the superimposed grids produce the illusion of a three dimensional form, what sometimes seems like an isometric projection of a stepped cubic landscape. Three-dimensional forms are extruded from the interplay of the two-dimensional grids, flashing momentarily in the mind of the viewer before disappearing again. 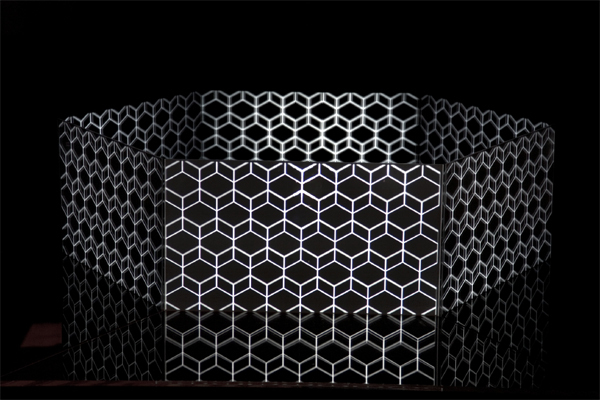 This projected image is reflected in the two-way mirrors to create the illusion of a constantly shifting 3-d hexagon. The title refers obliquely to Frederick Pohl's Gateway, a science fiction story in which humans are dealing with a collection of artefacts and technologies, one of which is an interstellar transportation system, which appear to been left behind by an alien civilisation. The story's characters attempt to use this complex system without a manual, with the intention of visiting other planets to scavenge for more artefacts. Despite endless speculation, they have no idea how they function or what significance any of these objects might have had for their creators.